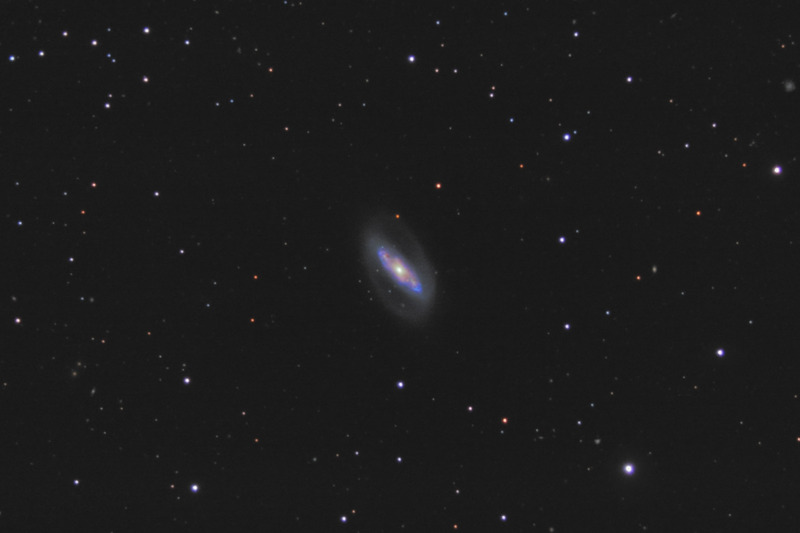 NGC 5377 is a barred spiral galaxy located 88 million light years away. Telescopically, the galaxy is fairly small - less than 4' x 2'. In 1992, NGC 5377 hosted the 8th supernova discovered that year. In this photo, North is up. This image is cropped to 45% of the original full frame. Software Used Images Plus 4.5 for camera control, calibration, stacking, digital development, Lucy-Richardson deconvolution, multiresolution sharpening, smoothing and noise reduction. Photoshop CS5 used for levels and curves, color correction, high pass filter, star shrinking, saturation adjustments, lab color, selective color, sharpening, and screen mask invert. Gradient Xterminator for gradient removal. Carboni Tools for additional saturation adjustments, noise reduction, and smoothing. HLVG for additional color correction. Notes This galaxy is not photographed very often, as I was only able to find a handful of images on the web. The galaxy is comparitively unimpressive, but I was happy with the reasonably good details i was able to capture as well as a number of faint background galaxies.